Joe loves Thomas. 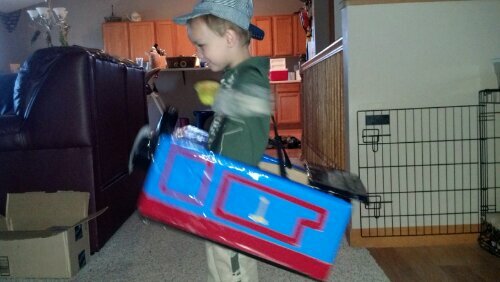 He loves trains in general, but Thomas is his favorite. 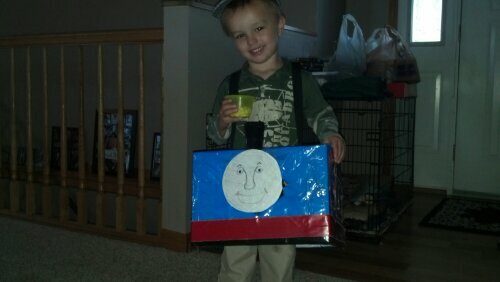 I thought I would be sewing his costume this year, but I saw this idea on Pinterest and couldn’t wait to try it. 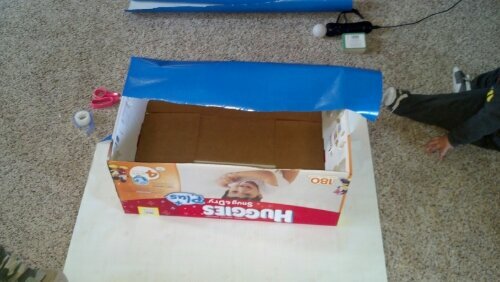 Start by cutting the side flaps off of the top of the diaper box with the xacto knife. Leave the shorter flaps folded in for extra stability. Then you wrap the box like a present, folding the paper in at the top. I reinforced the paper with packing tape because little hands like to pull at loose ends. 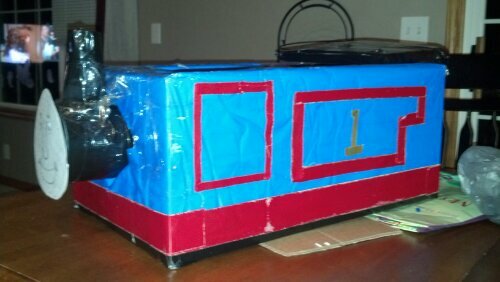 Using one of the boys’ Thomas models, I started to copy with the red, yellow and black duct tape. I folded the extra scraps of cardboard from the side flaps in half and taped them with black duct tape for the cab. 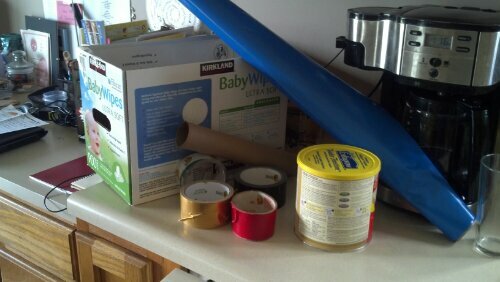 I put black duct tape around a toilet paper roll for the smoke stack and taped it to a black-taped coffee can. The boys were running around while I made this and Joe wanted to help. Only after remembering that I was making the costume for him and not for my own entertainment did I let him “help”. Joe freaked out a little bit when he saw the finished product the next day. I put suspenders on it and had him try it on. I think he likes it.